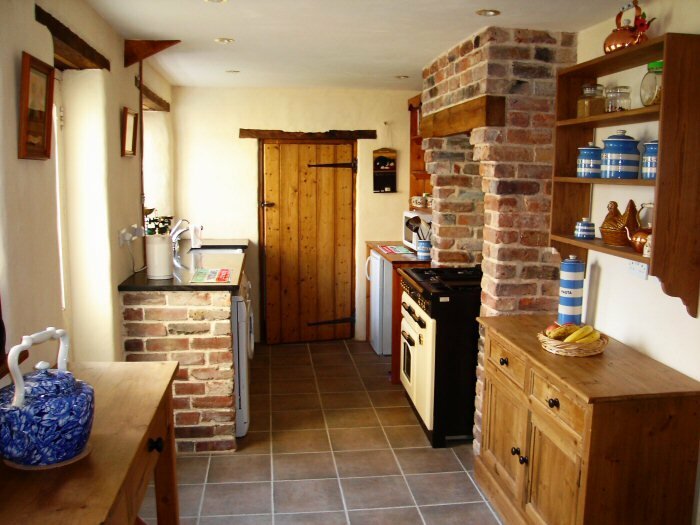 A kitchen in Shebbear, Devon in a 17th century cob and stone building that was modernised with cement, gypsum, Artex and a vinyl silk emulsion in 1970. Plaster was being forced from the wall at ground level by the rising moisture and the sealed walls also created the perfect situation for condensation and mould growth. The modern materials needed to be removed and traditional and breathable products applied. Since this work was completed all the problems caused by the build up of moisture has been eradicated. A brief outline of the work that was carried out and the materials that were used is set out below. The 1970’s kitchen units and appliances were taken out and the Artex was carefully removed with a professional Artex remover. The cement and gypsum plaster was hacked off to allow the cob and stone walls to breathe and a pantry was created at one end. Hand made reclaimed bricks are laid in Unhaired Lime Mortar. The tiles backing the range cooker do not go all the way to the floor – this allows moisture to escape from the wall. The walls received a harl coat before a float coat of Unhaired Lime Mortar was applied. A skim of Heritage Lime Plaster was used as a final top coat before painting with 3 coats of ‘Devon Cream’ Limewash. The ceiling is modern plasterboard that has been skimmed with a Heritage Lime Plaster on to a primer coat of DG27. The paint used was a breathable emulsion. This helps to tie the plaster in with the texture of the walls and makes the surface breathable and therefore less prone to condensation. Non fitted units and open shelves are used to allow the free flow of air to the walls. This further aids evaporation of moisture from this traditionally built house. Lime mortar, plaster and bricklaying by Mike Wye & Associates. Plastering and decoration by owners, Paul & Lyn Watts.